The follicles are lined with a single layer of flattened to low columnar epithelial cells. In less active follicles, as on the micrograph above, the lining cells are flattened. The connective tissue in between the follicles is thickened where capillaries are present. The mechanisms of thyroid hormone synthesis and secretion in birds is the same as in mammals. 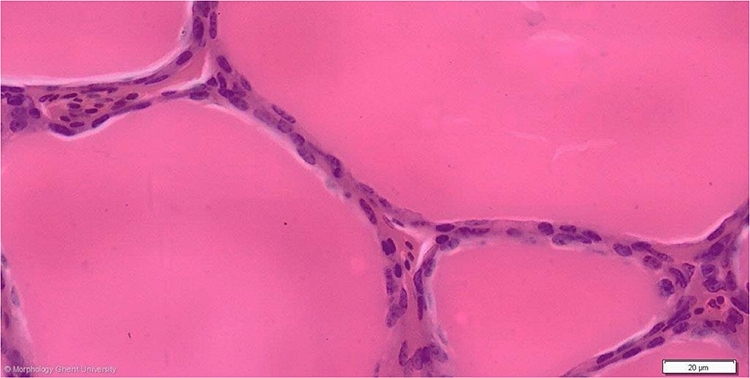 Calcitonin-secreting cells however are absent in the thyroid of most birds but are located in the ultimobranchial organ.